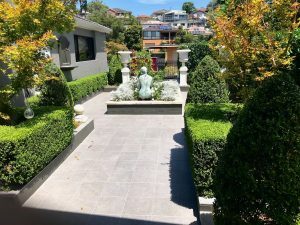 Murraya & Buxus hedges and shrubs after trimming at my customer’s garden in Eleebana. 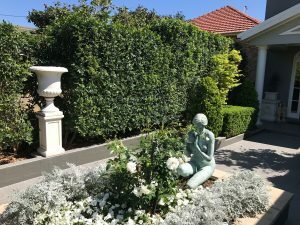 The previously overgrown Murraya hedge and Photinias were given a hard cut back with secateurs, loppers and the chainsaw last September and the Murraya have had their first formal trim now, in January. It was a lot of work but the gardens are now totally redeemed. 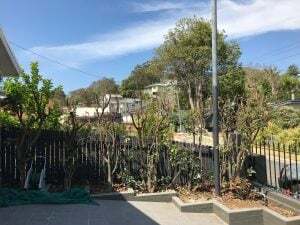 At that time the gardens were fertilised with cow manure and then mulched with Forest mulch. 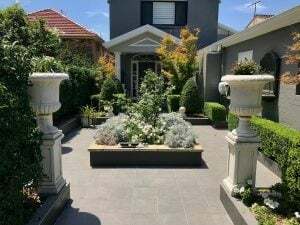 Now it all presents beautifully as a magnificent formal entrance garden to this lovely lakeside home. Cutting back as hard as this is called renovating a hedge. You’d need to know what you’re doing before you tried this at home yourself. Otherwise your trees can die back. Clean cuts are essential and large branches do better if the wound is painted with oil based paint. It’s a fiddlesome business, balancing up and around this height with a paint brush but it’s a guarantee against failure. Another thing to bear in mind is that these trees and the hedge all had long lanky growth, so you can’t just trim the extremities. 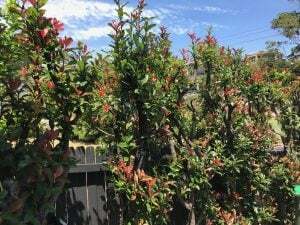 They need to be cut at varying lengths to encourage bushing up throughout the whole shrub or tree. I call it cutting at steps and stairs. 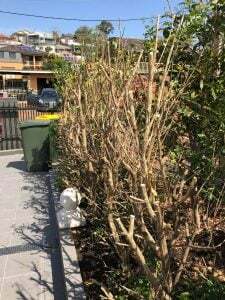 Have a look at the amount of cuts there are on the Murraya hedge and remember these were all done with hand tools. 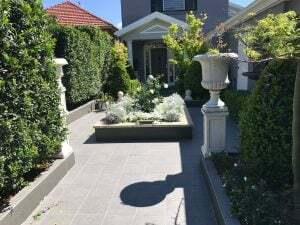 It’s a lot of work and therefore a big investment by the owners. But the results are eternal, if it’s maintained regularly and it really adds value to your home. I’m now only doing work like this for those customers who want me there on a regular basis. Would that be you?